I needed to use up some scrap glass. I dont have room to let it pile up. 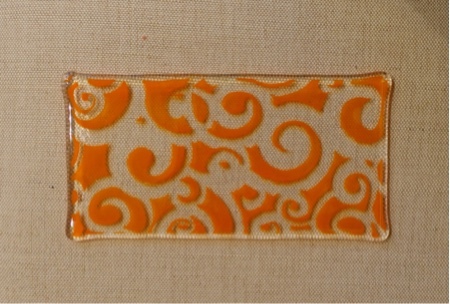 The piece above is just one layer of clear that I sifted tangerine powder over a stencil to create the design. 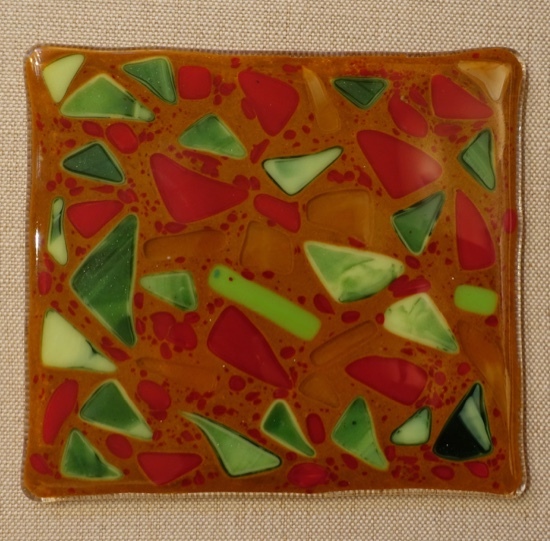 It can be cut up or incorporated into a collage of other pieces of glass. It may be the starting point of a new project. This second piece is about 6x7. It too started as a clear piece of glass that I sifted a heavy layer of brown powder evenly all over. Then I placed some scraps of opal greens and reds and various transparent yellows on and full fused. When full fused it came out to nearly 6mm thick so I think I may clean up the corners and slump it. We'll see. Here are the results of the projects I posted earlier today. Not masterpieces but a learning process toward materpieces. 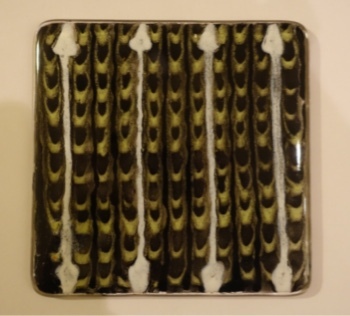 This came out of the kiln pretty much looking the way it went in. It fired well at my fast rate in the fiber kiln with no bubbles. The blue color was my Color Line enamels from Bulleye. It worked equally as well as the GLASS LINE paints. Now this one came out of the kiln a bit different then expected. When I back painted around the leaf pattern I did not realize the paint would be affected by the paint under it. It turned the aqua color much much darker so there was not the contrast I was hoping for. It is acceptable but not what I wanted. I will keep posting more projects of this nature. I am waiting for some Papyros kiln paper which is sturdier for doing more of a watercolor effect . This piece was pretty much as expected. Not perfect but has its merits. This was aloe vera paint made with glass powders and the aloe gel. I painted lines from a squeeze bottle and then combed thru the wet paint to make the pattern. There is also some french vanilla used on the 4 bolder stripes. 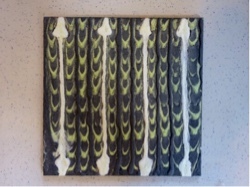 This piece did not involve using the kiln paper between glass layers. Thanks to Tanya at AAEGlass I am experimenting again. I bought a $20 video she called "Lithograph in Glass". It is well worth the money and opens up all kinds of ideas for me and hopfully for you. Because I only have thin fire right now that is what I'm using. 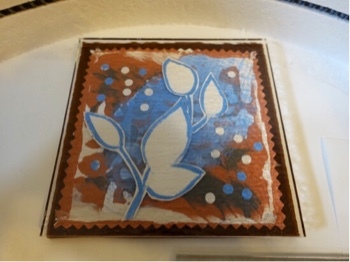 From her video I learned you can fire kiln paper between glass if you leave a 1/4 inch border between the paper and the glass edges so that the glass totally encloses the paper and none of the paper sticks out around the edges. After you cut the paper to size you can paint on it with your enamal paints. Dont water the paints down too much or the thin fire may deteriorate. On some of my glass trials I used an opaque glass as the base. If you want to use clear glass you'll see the back of the kiln paper on the back and I dont know if the logo pattern will burn off or not so either use opaque base glass or paint the back side of the paper also with any color or design you may like. These pieces were just quick samples to see if it worked or not and if I could use the fast firing schedule for the Bonnie Glo Kiln. They are not works of art but I found out what I needed to know from doing these pieces. Now they can be slumped into small sushi style plates. this piece was painted with 3 colors on the paper then the black line art was done on the top clear glass. 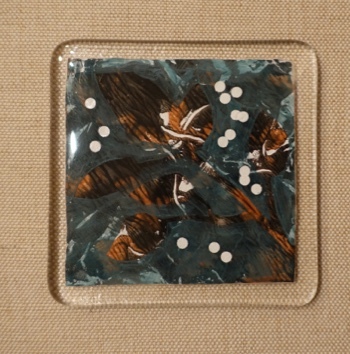 This piece has all the paint on the kiln paper with clear glass on top. 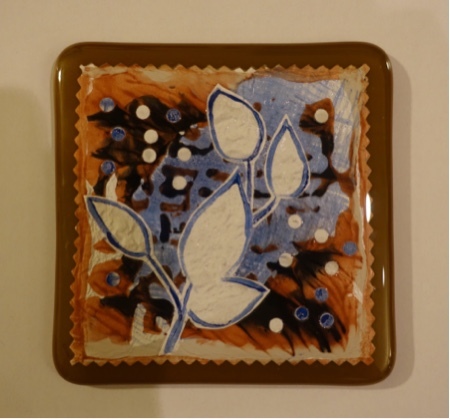 Two more pieces with the leaves are in the kiln now. This is almost like journaling or scrapbooking with fused glass. 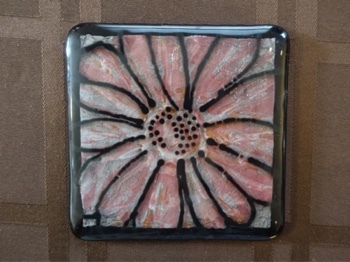 I used a paper punch to punch holes out of kiln paper that was either left white or painted a color. Also used layers of Glass Line paints on the paper. One I back painted around the leaves with the aqua color and the other one I cut out a second layer of paper leaves and also used pinking shears to trim the edge. Cant wait to see them fused tonight. 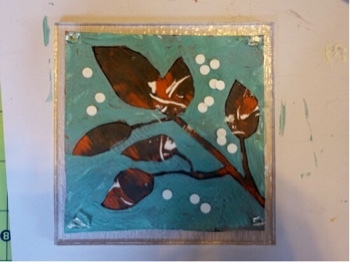 There are many ways to use the painted kiln paper. You can cut it up into shapes or paper punch shapes. You could stencil or rubber stamp on it. Or you could just paint a painting on it. You could also silk screen on to the paper. Lots of things to try. I do recommend buying the video mentioned above. It has some great ideas. I had some glass scraps left over with some impressions I took from left over paints on glass. 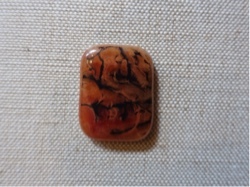 After the paints were dry I cut up the glass into pendant size and used it as a cap. 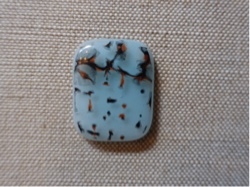 I took a white piece of opal glass and sifted a solid color of powder over it then placed the cap with the color line paints on top of that and fired along with the first samples above. Each piece I used a differed color of powder for the base. I was quite happy with the look. I made four different colors of these. 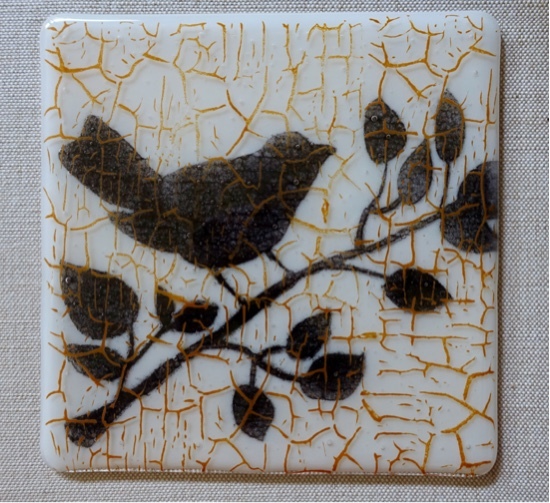 The piece below was just a spur of the moment piece to help fill up the kiln. I had some scraps laying on the table and decided to try something. This is how you learn. I mixed up some brown powder with aloe vera gel to a peanut butter consistency. I spread it evenly across some clear glass with a spatula then placed scraps of glass on top and pushed them lightly into the thick paint layer. 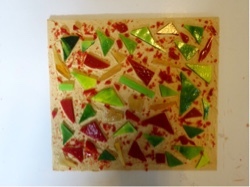 Then I scattered some scrap red frit over all and brushed it off the big pieces of glass. It will be next inline for the kiln. Its a good thing I dont have a big kiln because I would have glass pieces stacking up all over the place. One more not so good trial piece. But we'll see when its fired. The piece below is Aloe Vera and powders mixed in squeeze bottles. After squeezing lines of color on clear glass I combed thru it with a tool to create the pattern. I let it dry overnight and placed it on another piece of clear Tekta. It is also in the kiln right now. So stay tuned for the results in the morning. Can't wait! 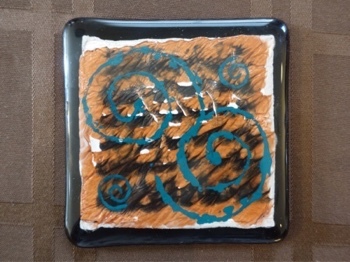 Stenciling on fused glass is easy and fun. With this piece I used white opal glass for the base. Next I used the bird stencil and taped it down. I painted aloe vera gel gently across the stencil onto the glass letting some of the gel go beyond the cutout onto the stencil. Then I sifted black powder evenly over the image area. Then I gently lifted off the stencil and shook off the loose powder onto a paper and poured it back into the jar and washed off the stencil. I cleaned up any areas of the design that needed it with a small brush. I fired this single layer at 1450. On the top layer of tekta clear glass I used another pattern stencil. Again I taped it down but this time I mixed the powder and gel together to make a paste about the thickness of creamy peanut butter. I used a palette knife and squeeged the mixture across the stencil making sure all the areas were filled and smooth across the stencil. For this step I used woodland brown glass powder. After firing I was surprised the powder was much lighter brown than I anticipated, but I find it acceptable. While the base glass with the bird was firing I prepared the top clear pattern and it had time to dry. When the base piece was done firing and cooling I placed the top piece on and full fused at 1500. This is what you see in the photo. Next it will be slumped into an 8" square plate.